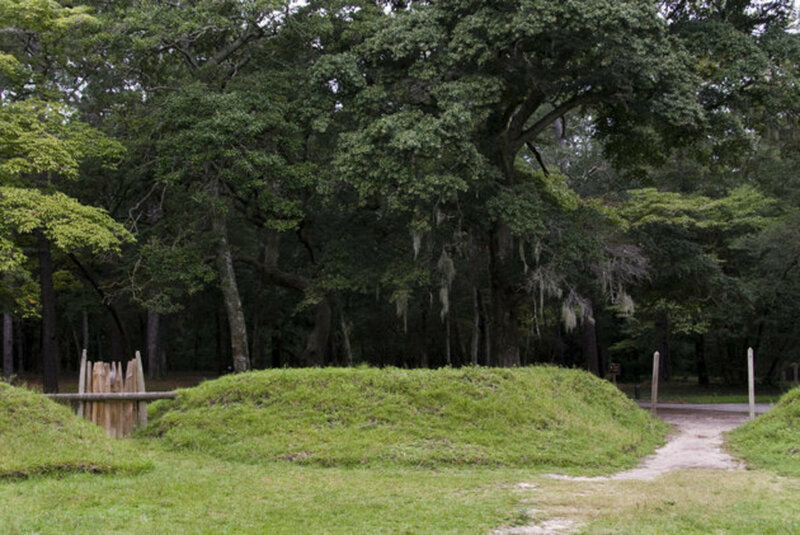 An unsolved mystery of American history is the “lost colony” of Roanoke Island. In 1584, Sir Walter Raleigh was granted a charter allowing him to settle land in the New World (near what would soon be designated as “Virginia”). Raleigh sent an expedition to Roanoke Island in 1584 to survey the area, led by Philip Amadas and Arthur Barlowe, which returned to England with positive reports of the area. In 1585, Raleigh funded an attempt to colonize Roanoke Island under the leadership of Ralph Lane. This settlement was abandoned in 1586 and the colonists returned to England with the aid of Sir Francis Drake. Raleigh then sent a second attempt to colonize the area in 1587, though with instructions to settle in the Chesapeake rather than at Roanoke. However, the colonists were left to settle at Roanoke and eventually sent John White back to England for needed supplies. John White did not return to the colony until 1590, only to find it completely abandoned. No trace of the settlers has been found to date, and mystery abounds as to their fate and why the Roanoke colonization attempts ultimately failed. By looking at the primary sources related to the colony from 1584 to 1590, it is possible to determine why the Roanoke colony failed and how these failings determined the fate of the settlers of the 1587 colony. The primary reason that the Roanoke colony failed was that its settlers were unprepared for the challenges that faced them in the colony due to the deceit inherent in the accounts and drawings published by Raleigh’s initial explorations of the area. The first of these accounts comes from Richard Hakluyt, who never visited the area (and perhaps never sailed to the Americas at all). Born in 1552 and graduating from Christ Church in Oxford in 1577, Hakluyt was known for his fascination with accounts of voyage and adventure, which led him to a career lecturing on geography and writing accounts of voyages to the New World. Hakluyt was also a friend of many of the sea captains of the era, including Sir Walter Raleigh. After his return to England from Paris in 1584, he presented to the Queen A particular Discourse concerning Western Discoveries, written in the year 1584, by Richard Hakluyt, of Oxford, at the request and direction of the right worshipful Mr. Walter Raleigh. Excerpts from this pamphlet show that Hakluyt believed that the new world held the resources which England currently obtained from “Steelyard merchants, or by our owne merchants” such as flax, hemp, tar, and timber and that these could be supplied by the colonists in exchange for “Woollen clothes, Flanels and Rugges fit for those colder regions” where they would be settling. Hakluyt also stated that the passage to Roanoke would not bring the settlers into the coastline of any of their enemies, perhaps unaware how easily the natives of the Americas could become enemies or how dangerous they might become when provoked. A second positive portrayal of the New World appeared in Arthur Barlowe’s report from his 1584 exploratory voyage to Virginia. It is believed that Arthur Barlowe was a member of Sir Walter Raleigh’s household, but little is known about him since he disappeared from the written record shortly after his return from Virginia. Thus, it is very likely that the descriptions in his account were overly idealized and omitted key facts about the New World that would have aided settlers in gaining a more informed opinion of the hazards they were about to undertake, though the descriptions helped Raleigh fund and man his colony. His account details two key descriptions of the area. First, Barlowe asserts that the area for the colony is overly abundant, full of “Deer, Conies, Hares, and Fowl, even in the midst of Summer in incredible abundance. The woods are…the highest and reddest Cedars of the world” He also describes the bountiful fish, as seen in his first encounter with the Indians, and the bounty of the soil. In fact, Barlowe even asserts that the seeds of Peas he sowed in the soil were fourteen inches high after ten days. This may, in fact, be an exaggeration, as most varieties of peas take at least 50 days to reach their full height of 18-30 inches, and thus it is highly unlikely that his seeds would have sprouted to fourteen inches in just one-fifth of the time it takes for common varieties to mature. Second, Barlowe asserts that the natives are “very handsome and goodly people, and in their behavior as mannerly and civil as any of Europe” in the land of chief Wingina (also known as Piamacum in other accounts). He also cites possible evidence of prior European contact with the tribes, in relaying information from his Indian informants of contact in the town of Sequotan “near unto which, six and twenty years past there was a ship cast away, whereof some of the people were saved, and those were white people, whome the country people preserved”. Such a voyage would have taken place circa 1558. Research into the possibility of such a shipwreck yielded no results other than two major hurricanes occurring in this time which affected the Spanish ships near Florida, thus Barlowe’s account is most likely false and designed to portray the Indians as friendly and welcoming people. Thus, written accounts of the New World before settlement were used as propaganda to support Raleigh’s venture, an appealing piece of advertising to a European nation just emerging from the throes of the plague and medieval warfare. 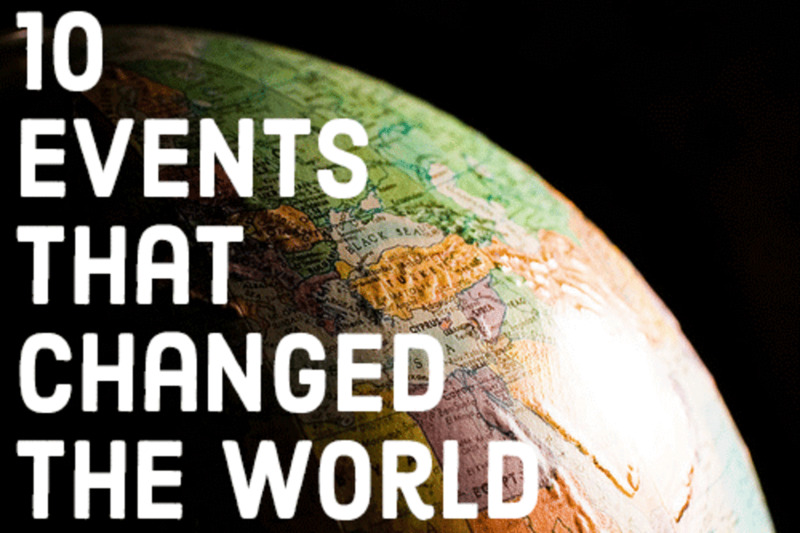 The New World, then, was just the kind of paradise the settlers desired and this led them to believe that colonization was a good alternative to their current conditions. The second reason the Roanoke colony failed can be determined from the accounts of the first colonization attempt in 1585-6. These accounts detail three factors that determined whether a colony could succeed and thrive in the region. 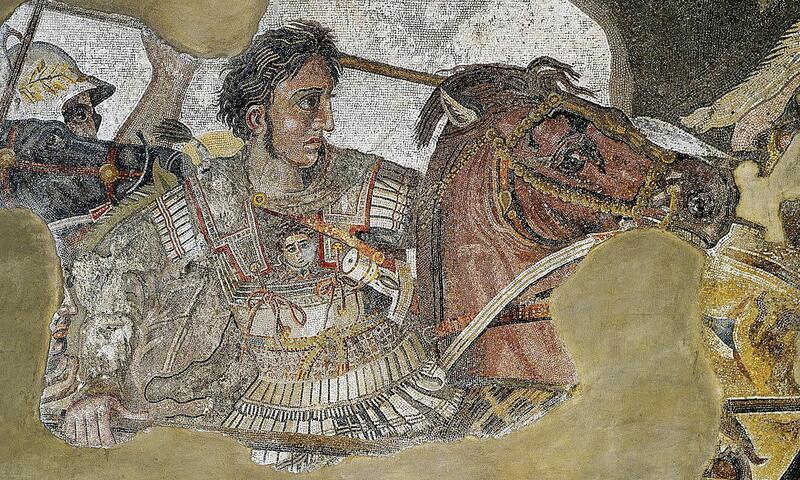 “making signs that it would defend him against his enemies arrows: for those people maintain a deadly and terrible war, with the people and King adjoining”. 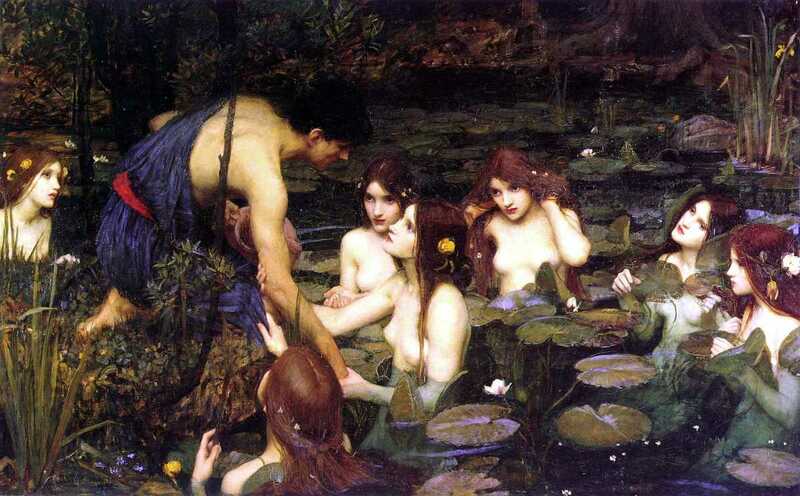 He further details the war, stating that there was a peace made between the Secotan (to which Granganimeo belongs) and the other king, Piamacum, but “there remains a mortal malice in the Secotanes, for many injuries and slaughters done upon them by this Piemacum”. It is plausible to assume that any alliance made with the Secotan would deny the settlers any hope of a peaceful relationship with Piamacum and his tribe; in fact, alliance with the Secotan may have even drawn the settlers into the existing warfare. “we came to an island, which they call Raonoak, distant from the harbor by which we entered, seven leagues; and at the North end thereof was a village of nine houses, built of Cedar, and fortified round about with sharp trees, to keep out their enemies, and the entrance into it made like a turnpike very artificially”. Thus, the Secotan may have viewed the settlers’ attempt at Roanoke as an intrusion upon the Secotan’s territory. While Barlowe and his expedition would have been welcomed as traders, the settlers of 1585 would have been eventually rejected when the Secotan realized the settlers were there to stay, not just to trade. Given the descriptions of the New World detailed above, would you have chosen to leave your life - probably a bleak one - for the promises of the New World? Yes, I'd take the chance on a better life. No, I'd keep what I knew. The final factor can be found in Ralph Lane’s description of Roanoke in 1585. 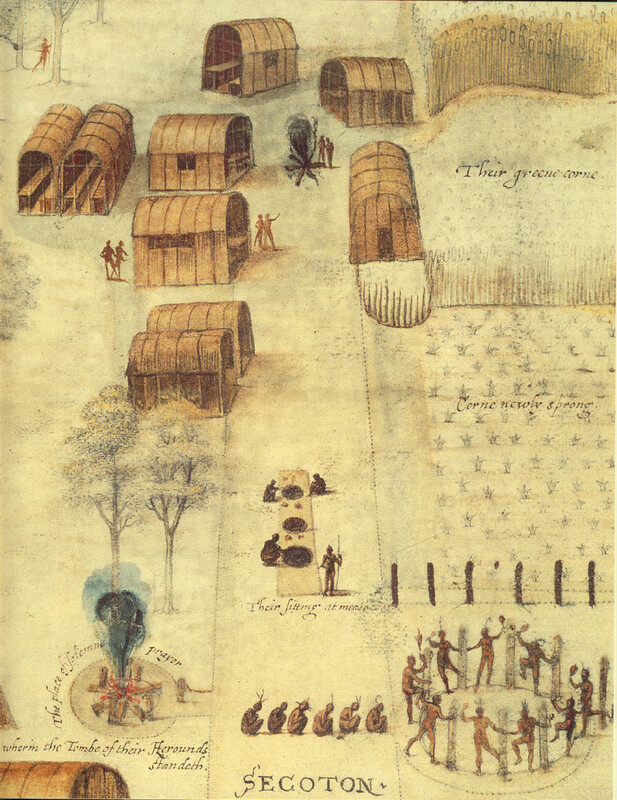 Ralph Lane was the governor of the first colony at Roanoke, but he was also known to be “not diplomatic in dealing with the Indians and often reacted violently to provocation.” In Lane’s 1585 account, he refers to the Indians as savages and believes that they know no use of the resources that the land provides, such as wine, oil, flax, etc. His attitudes are further revealed in his 1586 account of the events at Roanoke. In this account, Lane reveals that he was suspicious of Wingina and tries to meet with him to “put suspicion out of his head," but the chief delays the meeting. Lane then decides to try keeping the Indians from leaving to notify other tribes, believing that the Indians are plotting against the settlers: “that night I meant by the way to give them in the Island a sudden attack, and at the instant to seize upon all the canoes about the Island, to keep him from advertisements”. During this episode, one of Lane’s men overthrows a canoe with two Indians in it and chops off their heads, which is witnessed by Indians on the shore who Lane believes have been spying on the settlers “both day and night, as we did upon them.” A battle ensues between Lane’s men and the Indians, during which the chief, Wingina, is killed. Within a few days of the battle, Sir Francis Drake’s fleet comes to the Roanoke colony; Lane and the settlers flee the colony aboard Drake’s fleet, probably believing that a deadly attack by the Indians was eminent. Thus, Lane provides the final fatal blow to the colony: he destroys all hope of peaceful relations with the Indians by killing their chief. When combined, it is improbable that any colony could have survived in a region already settled by a large tribe (as the Secotan were part of the Algonquian group of tribes which dominated the eastern seaboard of what is now the United States) and that was exposed to inter-tribal warfare, which the settlers would have been drawn into through alliances with certain tribes. It is even more improbable that any colonization attempt would have succeeded once Lane had severed the peaceful relations between Europeans and Indians, which most likely created a “thirst for blood” on the part of the Secotans. So what happened to the colonists of the 1587 attempt? Entering a cultural region that already held a strong dislike for Europeans as well as a landscape that was strikingly different from the countryside of Britain, the colonists would have faced challenges for which they were highly unprepared. They did not know the local languages, had limited knowledge of local plants and resources, and were isolated from any help that might have come to their aid. There were no stores to turn to for supplies or family to run to for help: it was only the settlers, on a remote island off the North Carolina coast, exposed to hurricanes and the wrath of a tribe that sought revenge for the death of Wingina. The settlers had very few friends among the Indians, as detailed by Ralph Lane in his “Account of the Englishmen Left in Virginia” in 1586. Lane’s friend in the tribe, Ensenore, died in April of 1586. “He alone had before opposed himself in [the Indian’s] consultation against all matters proposed against us.” In addition, Lane admits in his 1586 account that he held the son of one of the Indians as a prisoner for some time, with some indications that he threatened to torture or kill the prisoner, though no reason is given for this imprisonment. 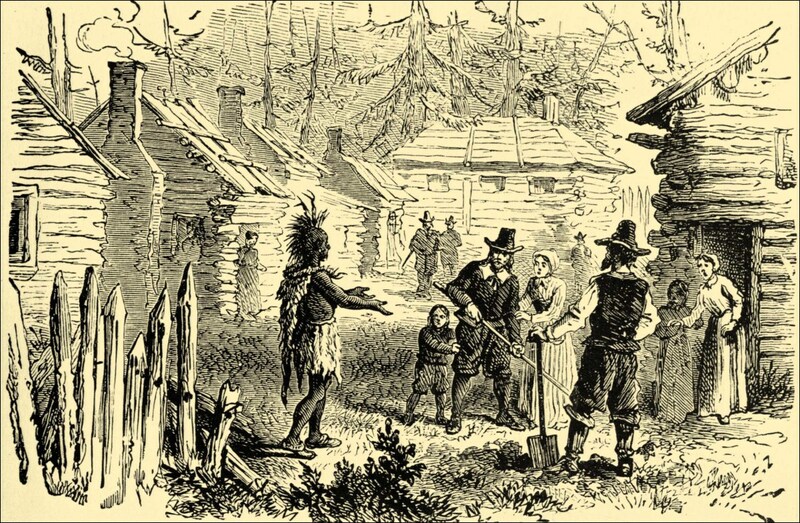 Combined with Lane’s killing of Wingina, the Indians would not have looked forward to white settlers attempting to settle in Roanoke. The settlers were, in fact, victims of not only Lane but of the captain that brought them to America. John White’s 1587 “Fourth Voyage to Virginia” account (also called the “1587 account of the second effort to launch a colony at Roanoke”) explains that Raleigh sent explicit instructions to the second group of settlers to settle in the Chesapeake Bay area, not near Roanoke. Under Captain Simon Fernandes, the second group sailed to Roanoke in order to locate and retrieve fifteen men who had been left by Grenville shortly after Lane’s group had left the island. However, Captain Fernandes was eager to begin privateering in the Caribbean (which would have helped him amass considerable wealth and status back in England) and left the settlers on Roanoke. The stranded settlers did not find the fifteen men whom they had hoped to rescue; instead, they found “the fort razed down, but all the houses standing unhurt…overgrown with Melons” and later learned from a local Indian that the fifteen men had most likely been killed by the Secota, Aquascogoc, and Dasamonguepek tribes. White’s account then details that the settlers were running short on supplies and, in August, asked him to return to England for supplies. White left the colony on August 25, 1587, unaware that he would not return (for various reasons) until 1590. When White returned to the colony in 1590, there was little trace of the settlers. 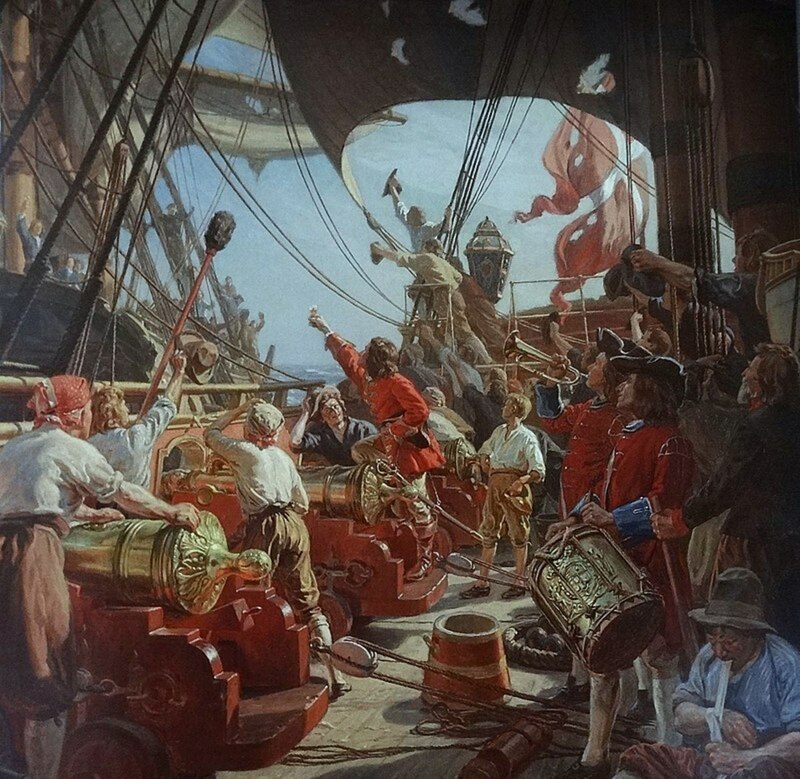 In his account of his return, White describes seeing a great smoke rise near the colony from his vantage point on the ship, although he does not reach the colony for another two days. When he arrives, White states that “we saw in the sand the print of the Savages feet of 2 or 3 sorts trodden the night, and as we entered up the sandy bank upon a tree, in the very brow thereof were curiously carved these fair Roman letters C R O: which letters presently we knew to signify the place, where I should find the planets seated, according to a secret token agreed upon between them & me”. He further details finding one of the trees to have had bark stripped away and the word “CROATOAN” carved into it. 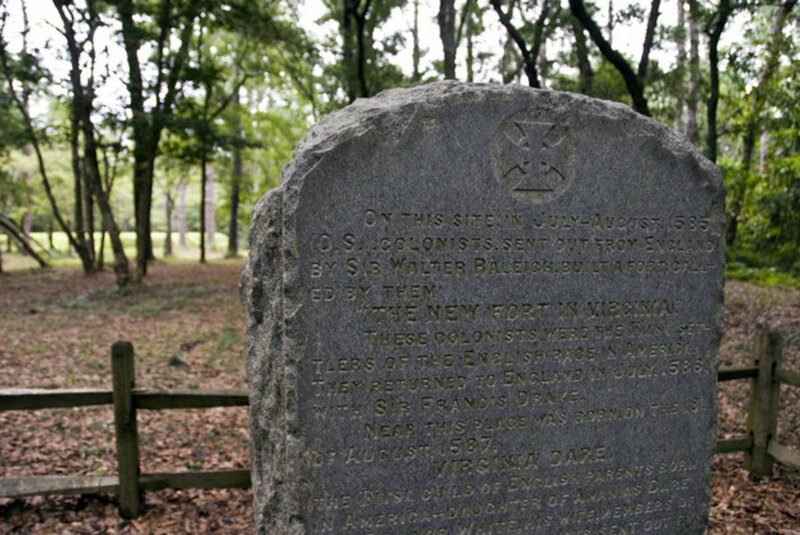 However, there is the peculiar absence of the cross sign which White and the settlers had agreed would indicated distress before his departure in 1587. White also notes that several chests had been buried and then dug up, and “about the place many of my things spoiled and broken, and my books torn from the covers, the frames of some of my pictures and Maps rotten and spoiled with rain, and my armor almost eaten through with rust: this could be no other but the deed of the Savages our enemies at Dasamongwepeuk”. Despite this evidence, and further searching, White is unable to conclude an explanation for why the settlers disappeared. 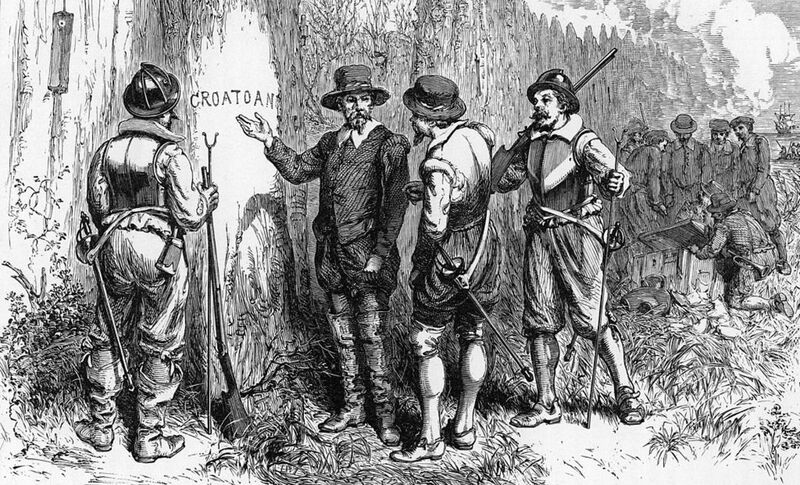 The evidence from his account suggests that the settlers evacuated the Roanoke colony for Croatoan Island, which is also on the Outer Banks of North Carolina. However, it is highly unlikely that the settlers made it to Croatoan or, if they did, survived for very long: they were still in enemy territory. By looking at how the Roanoke colony failed, we can see that the 1587 colony – and any other attempts which might have been made thereafter – was doomed to failure before it even began. Sir Walter Raleigh’s eagerness for a prosperous colony led him to utilize propaganda: overly optimistic and idealized accounts by a friend (Richard Hakluyt) and a member of his household who traveled to Virginia (Arthur Barlowe) combined with images of the Indians sketched by John White in 1585 during his first trip to Roanoke that made them seem less numerous and more prosperous than they probably were in reality. The desire to portray the New World as bountiful and ready for Europeans would ultimately leave the settlers unprepared for the challenges of the New World: the isolation, the necessity of self-sufficiency (with no “backup” by running to the nearest European town), encounters with Indians who were not just simple farmers and hunters that could be Christianized (but who, in fact, were a complex network of tribes that claimed dominion over the coast and thus would view white settlements as an invasion), and an unfamiliarity with the ways in which to harness or harvest the natural resources available to them. Ralph Lane complicated the fate of the 1587 colony – and the Roanoke colony as a whole – through his violent and un-diplomatic encounters with the Indians during the first attempt at colonization. 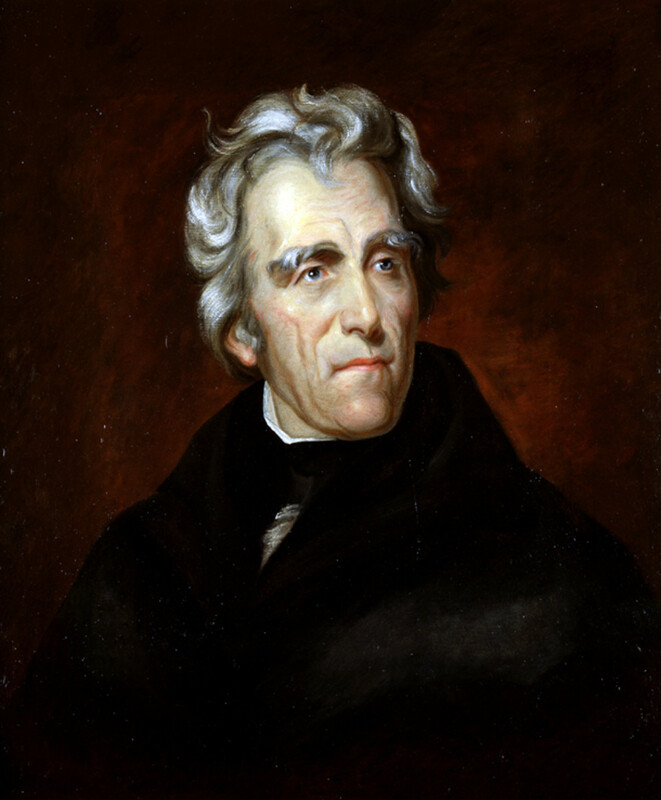 Success of the colony depended upon cooperation and help from the natives; Lane destroyed all hope of such relations with the keeping of Indian prisoners and the killing of Wingina. Any settlers who would come to the territory after Lane’s transgressions faced nearly certain retribution from the Indians. The 1587 settlers may have avoided this fate if it had not been for the actions of Captain Fernandes, who abandoned them on Roanoke (instead of taking them to the Chesapeake) so he could go privateering in the Caribbean. This left the 1587 settlers exposed and vulnerable, at the mercy of both their environment and the neighboring tribes. If the settlers had arrived fifty or one hundred years later, a much different picture may have emerged: by the mid-1600s, European diseases had begun to ravage Indian populations, weakening the tribes and making them susceptible to the incursion and dominance of Europeans. The 1587 settlers were, unfortunately, too early to benefit from the devastation of disease on the Indians and too late to mend the relations which Ralph Lane had utterly destroyed. 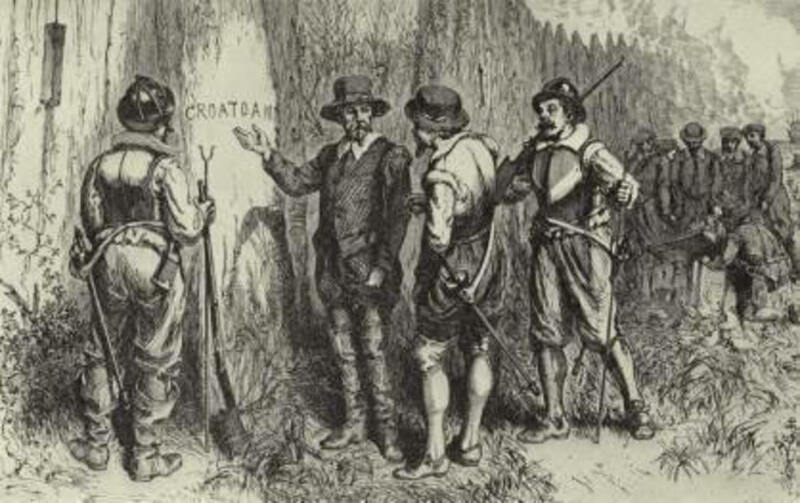 Ultimately, the 1587 settlers most likely fled to Croatoan, realizing that their lives were in danger. Whether they made it to Croatoan Island will probably never be known, but it is almost certain that whether or not they made it, they died or were captured by the Indian tribes that had a duty to avenge the death of the chief, Wingina. There's so much history in the Manteo/Roanoke Island area of North Carolina. It's a great place to visit. I'd highly recommend the outdoor drama, The Lost Colony. The setting is fabulous and the story, played out in that setting, becomes one you'll never forget. It's been 35 years ago or more since we attended and I'd love to go back. Fascinating write here on an interesting topic. Congrats on the HOTD! Roanoke has always been a fascinating topic. It's amazing how urban legends can spring up surrounding a mystery, I've heard everything from big foot invasions to aliens to time portals, lol. It's always refreshing to read credible theories. Great hub, congrats on HOTD. I found this very interesting and full of information . I had read about this recently but found it still enthralling. Congratulations on the hub of the day award. This is a wonderful explanation about many of the events that led up to the colonization of the colony of Roanoke and speculation as to what might have happened to those early settlers. Congratulations on a well deserved Hub of the Day! This is a fascinating episode in our nation's history. I love watching documentaries on the subject. I don't remember hearing about the "sales" job that was done on these folks. Interesting! Thanks for sharing some additional insights and congratulations on Hub of the Day! I agree with pstraubie. I'm also drawn to articles like this about mysterious events or unexplained phenomena (I remember another HOTD of a few months ago about that mysterious man found dead on a beach). I read about Roanoke a couple of years ago, and it's pretty fascinating. Not only because of what might've happened, but for the way our mind tries to figure out the events, coming up with potential explanations. Maybe years from now we'll be reading hubs about that Malaysian airplane. Unfortunate, yet unexplained events. Voted Up and Interesting. Congrats on HOTD! I never fail to be drawn to articles about this topic. I grew up in Virginia and have heard numerous accounts and much speculation as to what happened. I often wonder if there is ever any way for us really to know.